Today only! 20% OFF EVERYTHING + Free worldwide shipping on everything at Society6. Note: A lot of drawings are now available as metal prints, notebooks, clear iPhone cases, and bath mats (the newest kind of product added to Society6's catalogue). An original drawing in the "Nature" gallery. If you're interested in buying the original of the drawing or a print, please contact me. The drawing is also available as prints, stretched canvases, phone cases and more in my Society6 store. TODAY only! 20% OFF + FREE worldwide shipping on all Blankets, Comforters & Duvets at Society6. Offer ends January 16th, at midnight PT. TODAY only! 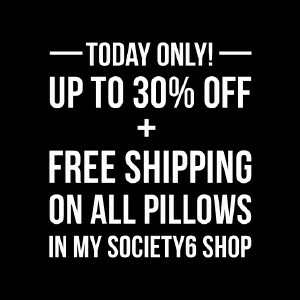 $6 OFF ( = Up to 30% Off) + FREE worldwide shipping on all Pillows at Society6. Offer ends January 12th, at midnight PT. I've added the first 2 steps of a work in progress for a drawing titled "Magnolia" in the "Nature" gallery. The next step will be added as soon as possible. TODAY only! 15% OFF + FREE worldwide shipping on all Wall Art at Society6. Wall Art = Art Prints, Framed Prints, Canvas Prints, Metal Prints, Wall Tapestries, Wall Clocks. Offer ends January 9th, at midnight PT. By clicking on the Promo Link below, you'll get 15% Off + Free Worldwide Shipping on EVERYTHING when you order from my Society6 Store. So if you'd like to purchase items from my Society6 store, that's the right time! Happy New Year and best wishes to all of you. May 2017 bring you all you desire. I hope you enjoyed visiting the website this year and that you'll keep on following the new works in progress, be they for original creations or fanarts. - all the information about personalized drawing commissions and the other products can be found on the page "Terms of Service"
- all the artworks available as original and prints are listed on the page "Originals for Purchase"
A color pencil portrait of Ryan Gosling as Holland March in "The Nice Guys" in the "Cinema" gallery. For copyright issue, this drawing won't be available as original or prints. Merry Christmas to those who celebrate and to all of you, Happy Holidays! "8 Days of Deals" at Society6. Here's the last one: for the first time ever, 25% OFF EVERYTHING + Free worldwide shipping on everything. "8 Days of Deals" at Society6. Here's the 7th one: $5 OFF Stocking Stuffers + Free worldwide shipping on everything. "8 Days of Deals" at Society6. Here's the 6th one: 20% OFF Tapestries, Pillows (square pillows, rectangular pillows), Clocks, Towels, Rugs & Shower curtains and 10% OFF everything else + Free worldwide shipping on everything. "8 Days of Deals" at Society6. Here's the 5th one: 20% OFF Pillows (square pillows, rectangular pillows), Blankets, Duvets & Comforters and 10% OFF everything else + Free worldwide shipping on everything. "8 Days of Deals" at Society6. Here's the 4th one: $5 OFF Apparel, Totes, Pouches, Mugs (regular, travel mugs, metal travel mugs), Phone cases & Tapestries + Free worldwide shipping on everything. Until December 12th, Society6 is running an offer called "8 days of deals", which consists in different deals that are going to be unlocked one by one. Here's the 3rd one: $6 OFF Phone Cases, Clear Cases, Skins, Laptop Sleeves, Art Prints, Framed Prints & Tapestries + Free worldwide shipping on everything. Here's the 2nd one: 20% OFF Wall Tapestries, Canvas Prints & Metal Prints + Free worldwide shipping on everything. Here's the 1st one: 20% OFF Art Prints & Framed Art Prints + Free worldwide shipping on everything. I've added the first 2 steps of a work in progress for a portrait of Ryan Gosling as Holland March in "The Nice Guys" in the "Cinema" gallery. I'll add the next step in a few days. TODAY only! 15% OFF all Home Decor + FREE worldwide shipping on everything at Society6. Home Decor = Wall Tapestries, Pillows, Throw Blankets, Rugs, Clocks, Duvets, Comforters, Shower Curtains, Towels, Mugs, Stationery Cards. Offer ends Dec. 1st, at midnight PT.